Last time I posted I thought I might be starting to write the first side-quest for the module. However, I was side-tracked when I decided I needed to finish working on my world map system and also after reading Wyrin's Blog and a post about his own world map. In particular, check out his great tutorial on tracing maps in the toolset. Now, after giving the SoZ system a little thought, I am wondering if this system is going to be right for my own campaign. The problem is, my module has a unique calendar system (already implemented) that gives days and dates according to my own world setting. I want to be able to mark the passage of time as the player chooses to travel overland using the world map, and I am not sure how this is handled in the SoZ system. The passing of time also checks for food rations and updates the PCs vigour condition according to time, distance and supplies. In the last week, I have been successful in implementing this system using a modified version of the MotB world map, but wonder if it would be possible in the SoZ system? On the back of this, I wanted to do a poll (check side panel) to ask people their "mapping preference" and if they have a favourite system or not? I am not saying whether I can make any changes, but hearing peoples comments and opinions on the matter may help me coordinate my own system. Here is a screen shot of a working map system using a version of the MotB map system. (Click on image for a closer view.) Unfortunately, the compression makes the text harder to read, but you may be able to see that the bottom box (which is currently labelled "OTHER INFORMATION") has some of the extra information I coded for the travelling system. You will notice that the text is currently in red to denote that the party has too few rations to meet the needs of the journey they are querying. The "TRAVEL TO SELECTED LOCATION" button is also disabled because of this. The system does allow the player to try the journey on fewer rations than normally required (by sharing food rations between the party), but the PCs vigour level will be penalised for the journey if they try it, based on how much rationing they had to do. The system also allows for the new Arcaene Spell: Create Food & Water to allow the PCs to be able to create rations magically during their journey. This mapping system still supports the Map Within Maps system that I designed in the early days of development. The top icon in the above map links to a second world map that opens if clicked upon. And if this is done, the data of the last selection (even if made on the previous map) is still maintained on the second map until a new selection is made. In case it's not obvious, I like maps. To me, they are one of the core features of a good D&D adventure and the use of them adds a level of excitement (in my opinion). To this end, I have developed this system to allow the player to find maps that also open the world map (but disables travel). When opened, the map opens for all players in a multi-player game so that the group can discuss a route as if talking around the map. There is also another use of this system, the details of which I am keeping quiet about for the time being, except to say it is part of something called the "Nexus System" and is something players will soon learn about when they start to play. On a last note: This system was rewritten by me to avoid using 2da files. Now, a builder only needs to add location descriptions and add travel day time entries to one script and the code does the rest. The different world maps all have their own positive and negative points. While I enjoyed the SOZ system I feel that it fits a particular model, one of exploration. Just using it to move between areas can be tedious and prolong the story with travel. The description of you system sounds very interesting especially with the addition of rations. I would suggest not changing it. You are offering a new experience to the player. I'd say that the decision on which map system to use really depends on whether there will be gameplay elements on the map itself. 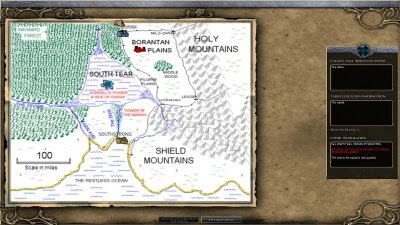 If all that is intended is a means to travel from one location to another, the campaign map system is more hassle-free. OTOH, if you'll have things like combat encounters on the map, then the OL system may be preferable. You reflect what I hope. :) I wanted to add an element where travelling meant something to the PC ... in the way of hardship and adventure. Adding time and ration requirements seemed a way to do this, and I hope that I have made it flexible enough for th eplayer to enjoy the different challenge. You highlight some of those things that I also thought would be good to do, but is where I had the conflict of interest with my initial design. That said, I am toying with another idea that may be able to make use of the SoZ map system in another way ... maybe with one of the new systems that involve water travel as well. I have also considered looking at coding "time zones" alongside the terrain changes that may help to add time in the way it works. I think it is the "other elements" that SoZ system introduces that I would quite like to get at (like the way the encounters work). I guess I will put the SoZ system on hold for a bit and let my subconscious mind work at it to see what may come up ... It would be quite interesting to have a combination of these maps involved, but I don't want it to conflict with my original design. I'm impressed by all the custom systems you're putting into place for your campaign, including what you're doing with the maps. It'll make for a new NWN2 playing experience for sure. As for prefered map system, it reallly depends on what works best for the mod. I do like these static illustrated maps however, and all things being equal, would go with one like that. I've been thinking of building one into Trinity, but there really won't be any selection of long-distance destinations involved. There will be long-distance travel between two locations, but I plan to represent that in a custcene, using 2d art and VFX. We'll see. Thanks for your encouraging feedback on the systems I am trying to put in place. :) I am doing my best to try to make them as easy to use and follow as possible, and also try to allow the player to "get involved" (or not) with them as much as they want to. Some will require more player interaction than others. I suppose maps do tend to be more about "long distance" travel than anything else. And this can be included or not subject to the demands of the story .. as many *including yourself" point out. I also like your idea of representing travel ... visuals and cutscene. It does sound like a good way of doing it if the number of distant locations does not apply in a module. What you're implementing into the map system sounds really cool, especially with the disabling/enabling travel dependant on rations.